With the university rugby season underway, a Taberite is bringing her experience at the U-20 Tri-Nations Cup back with her for the regular season. Keegan Brantner, who currently suits up for the University of Lethbridge Women’s Pronghorns rugby team as a lock, had a chance to put on a Canadian jersey this summer and play in the U-20 tournament held in Nova Scotia. With only three games on the tournament schedule, the team didn’t have much time to put things in place but the squad didn’t go in unprepared. Brantner, who was a Canada West All-Star last season in her second-year, said most of the team was already pretty familiar with each other coming into the tournament. Between the familiarity and the nature of the coaching staff, the team didn’t head into the games with any animosity. “It wasn’t super intimidating coming in because I knew most of the girls. It was just a really good time getting to spend time with my friends who I don’t really get to see because we all attend different universities and play for different provinces. The coaching staff was so fun. We had three off days when we were there and they made it a fun environment to be a part of,” explained Brantner. Heading into the tournament one of the biggest challenges for the Canadian squad was the size of their opponents. The Tri-Nations Cup featured a team from the United States and England, both of which provided a good challenge for the Canadians. They would win their first game against the U.S. but had trouble handling England in both of their matchups as they would eventually lose in the final game. “They were definitely a lot bigger than us. Our play style was a bit different than theirs but we held our own. We did come out winning against the States, so that was good. We lost both of our games against England which sucked but we played pretty well against them. They were a lot bigger than us and had a played together for over a year. 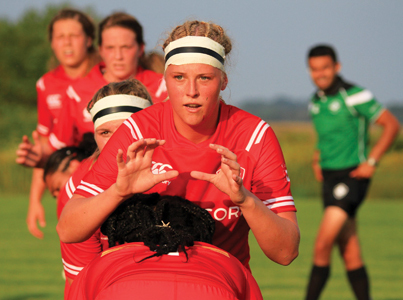 It was a big stepping stone for Rugby Canada moving forward to the World Cup,” said Brantner. While far from being Canada’s sport, the country has seen more interest in the sport over the past several years. Brantner and her teammates noticed the shift in attention they got throughout the tournament as the crowds at the games were quite big. “There was so many people at both places. Two of our games were at Wolfville and one was in Halifax. We always had a great crowd and the majority of us had our families come which was really nice to have them there. There was a U-16 and U-18 Rugby National Championship going on while we were there so all of them got to watch us play. They were there the whole time watching us practice and talking to us on our way to meal hall which was super cool to have them there,” she explained. With the reintroduction of rugby sevens in the Olympics in 2016, Brantner says that also plays a part in the visibility of the game to those who may have never watched a match before. The focus has shifted to Canada West regular season play for Brantner as the Pronghorns first game of the season went on Saturday where they faced the University of Alberta Pandas as part of the home and home Suggitt Memorial Cup. The team struggled in their first match where they saw a 17-10 loss after a slow first half where they saw themselves down 17-0. While the experience will no doubt play a factor in her play this season, the ability to get into games and extended training sessions has helped her transition into the university season. “We trained three times a day and we would have film and one on one with our coaches. For myself moving forward, I learned a lot. Abby Duguid from my school was on the team as well so moving forward her and I can work on stuff from Halifax throughout the school year. We’ve also brought back drills, especially around the scrum, to improve our university scrum,” continued Brantner. She will be joined once again by former Taberite Genna Wright as well who is heading into her second season of rugby with the U of L.
With the team boasting a roster of tons of returning players, the familiarity of the team is sure to have a positive effect on the team when they hit the field. With that in mind, the squad has their sights on this year’s nationals as an endgame. The Pronghorns will make their home debut on September 22 at the University of Lethbridge Stadium at 3 p.m. for game two of the Suggitt Memorial Cup.